We can’t change the world by ourselves. We need ordinary, cranky, thoughtful, and creative accomplices for this absurdly daunting task. 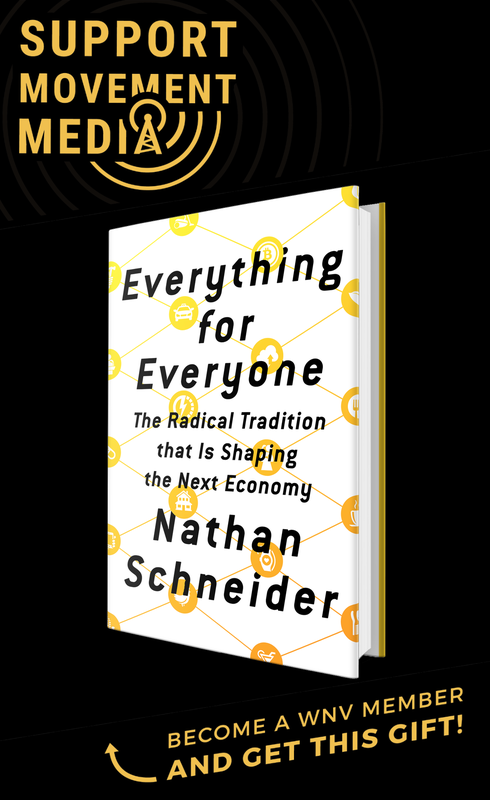 To envision transformation, to take action, to weather the inevitable storm—groups generally do this better than single individuals, however rugged they may be. So far I’ve been part of two circles that thrived on this kind of group wisdom and gumption. In the early 1980s I found my way into Spirit Affinity Group, a band of graduate students in Berkeley that resisted the nuclear arms race and the U.S. wars in Central America. For several years we conjured up one dramatic, nonviolent action after another. It was exhilarating to engage in a conversation with the larger community about war and peace using the most powerful language at our disposal: our vulnerable and unarmed bodies. Many of these public performances netted us from a few days to a few weeks in jail, and here, again, being in a group came in handy. There was always somebody to water the plants or call your boss, or—when things got a bit too heavy—to help you walk on into the unknown. The second magic circle I’ve been part of is Pace e Bene Nonviolence Service. This training and nonviolent action outfit has endured for two decades, not so much because of its organization acumen (if, as Dorothy Day suggested, precariousness is a virtue, Pace e Bene has been exceedingly virtuous) but because of the connectedness and enduring care that has crept in. I guess you could call it love. This past week Peter Ediger died. Peter was an indispensible part of Pace e Bene’s ensemble for many years. Based in Las Vegas, where Pace e Bene was founded in 1989, he brought to our community a lifetime of experiments in nonviolent change. Born in 1926 and reared a Mennonite, Peter was a conscientious objector during World War II, and then was actively involved in numerous campaigns for justice and peace. For Peter, nonviolent action was a spiritual journey rooted in articulating a more clear “No” and “Yes”: No to empire; Yes to the well-being of all. No to poverty; Yes to economic equality. No to weapons of mass destruction; Yes to meeting the needs of all. He was an inextricable part of the experiment Pace e Bene has been modestly conducting: Is it possible to put love in action to transform ourselves and to change the world? For Peter this was an ever-burning question. At Pace e Bene Peter was a jack of all trades. He filled book orders; he organized fundraising letters; he kept our small office here in Nevada going. But he also was part of a weekly peace vigil and actively took part in the emergent anti-drones campaign focused on the drone operations at Creech Air Force Base forty miles north of Las Vegas. 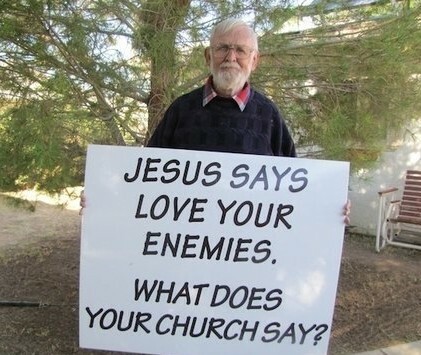 About six months ago he came to us with an idea he had been ruminating on: visiting churches in the Las Vegas area on Sunday mornings where he would quietly hold a sign with the words, “Jesus says love your enemies. What does your church say?” After standing there a while, he would then join the service. A week before his visit, he would send a letter to the church letting them know he was planning to be there. While this message might seem implicitly judgmental or provocative, Peter envisioned this as a non-threatening invitation for information-gathering, dialogue, and soul-searching. We encouraged him, and over the next several months he visited thirteen churches where he experienced a variety of responses, from being welcomed (“You’re preaching to the choir,” one church member said) to being threatened with arrest. Here are Peter’s reflections on each visit. Author and activist John Dear, S.J. wrote about this project just weeks before Peter’s death. This action, though a solitary witness, flowed from the support and reflection that Peter garnered from our circle. Peter would be the first to say he wasn’t a paragon of nonviolence, and we had many tussles over the years. But he was always on the case for nonviolent change, and most vigorously expressed this in his poetry and his eagerness to burst out in song at a moment’s notice. Three weeks ago Peter was on one of our staff calls, where we discussed future plans with excitement. Later that day he started feeling poorly and checked himself into the hospital. A few tests indicated liver disease, though this was never definitively established. Although he rallied a few times over the next couple of weeks, he increasingly alternated between restlessness and sleep, supported by family members and friends. Practically to the end, Peter was raising the call for nonviolent action. There are people everywhere who toil for justice and nonviolent change out of the limelight. Peter was one of these, and he will be missed. It’s hard to imagine not hearing his reliable voice on our weekly staff calls, or receiving his gifts of wisdom and song on a regular basis. Our circle was enriched by his presence and, now, by his enduring memory. Glad to see that not every churchie will act as though he is separate from Occupy. 99 out of one hundred churchies is the 99 percent! Thank you for the wonderful encouragement as we continue to confront Goliath.